I wish to especially thank Dr. Doug Tallamy for his on-going assistance with innumerable native plant butterfly relationships and related questions, in additon to granting permission to use his data on butterfly host plants. 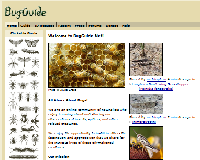 Doug Tallamy's website is full of important conservation research on the relationships between pollinators and native and non native plants. His best selling "Bringing Back Nature" has brought attention to the importance of growing native plants to support our native pollinators. Kenn Kaufman & Jim. P. Brock's "Field Guide to Butterflies of North America" is a superb resource for identifying butteflies, and their host plant preferences. In addition, I would like to thank Dr. Jeff Glassberg, founder and president of The North American Butterfly Association for his guidance, his publications, his wisdom and his generosity. NABA, a membership organization, keeps members and the public up to date on the status and habits of our North American butterflies. Jeff is the author of "A Swift Guide to Butterflies of North America" and other butterfly guide books that have extremely comprehensive data and excellent photogrpahs. 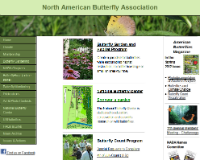 NABA offers timely articles; activities; events; science based publications; travel opportunites and an online chat-room where NABA members share butterfly information and sightings. Joining NABA has opened my eyes to a wealth of information, to helpful butterfly enthusiasts, and some terrific opportunities to experience butterflies non-native to my region. For those interested in on-going butterfly issues the NABA members' chat is definately a good read. Special thanks to Ron Birrell renowned nature photographer, who has graciously permitted us to link remotely to the superb butterfly images on his flicker site. To enjoy his complete portfolio click on this link to his web site. Thank you Linda Cooper, Jeff Glassberg, and Jim Springer of NABA for endlessly helping me identify my butterfly pictures, and Cynthia Mazur for help with my images taken in AZ and Mexico in 2001. 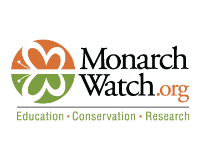 Thank you Chip Taylor for allowing us to link to the Monarch Watch images of the Asclepias, and to the Dallas County Lepidopterist Society for allowing us to link to wonderful caterpillar images. Thank you to the New England Wildflower Society, Michele Mensigner, Jackie Stone, Mary Arekalian, and Nat Dane for allowing us to post your images. The Butterflies and Moths of North America website provides an interactive map for recent sightings of vagrant butterflies (and moths) on the BAMONA site. Each butterfly on the butterflies.plantipedia.com is linked to the corresponding page on the BAMONA site where you will find extensive data about that insect. We encourge you to join BAMONA and share your sightings and pictures with them. To provide rmation about habitats, host plants and ranges of North American Butterflies data from various resources have been included: the State of GA DNR, The Dallas County Lepidopterist Society, National Audubon Society, BAMONA,The Butterflies of North America, by J. Scott,Through the Eyes of a Butterfly by Jackie Stone and Arabella Dane as well as field guides published by Swift, Audubon, Peterson, and others. The data about our most at-risk butterflies is based on the red list of the Xerces Society. The US Fish and Wildlife and National Wildlife Federationoffer many resources and programs related to butterfly conservation, planting for butterflies and other polllinators, pollinator and habitat issues. 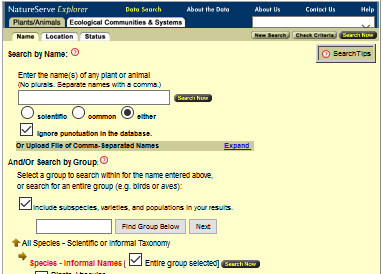 Plants listed as larval and nectar sources for our butterflies are linked directly to those plants (and vica versa) in plantipedia.com.In addition, where feasible, plants are keyed to show their USDA status (native, endangered, threatened, noxious weed, invasive etc.) and linked to the USDA plants profiles - USDA, NRCS. 2015. The PLANTS Database 9 November 2015. National Plant Data Team, Greensboro, NC 27401-4901 USA - with interactive data, maps and images. Native Plants of concern to the Center for Plant Conservation, are linked. Images from Prairie Moon Nursery are being linked to the native plant as time permits. In 2015 President Obama tasked the country with working to address the issues facing our pollinators. Business, Government, the Non-Profit Community and Citizens are collaborating as part of the Million Pollinator Gardens. In addition to the Million Pollinator Gardens Campaign, Garden Club Members, Communities, Corporations, and Individuals are working with the Monarch Watch on Monarch butterfly conservation; the National Wildlife Federation's Backyard Habitat on habitat preservation are collaborating with Xerces Society and other conservation organizations to help resolve the plight of the pollinators, to protect and augment their habitats, and to address their environmental needs. Although our intent is to present information that is accurate, we are not responsible for errors and omissions or any problems with the use of this program. This is a work in progress. This site is dedicated to Deen Day Smith Sanders in appreciation of her extensive work and long-term committment to butterfly conservation and butterfly education. Deen has among other things, donated the Day Butterfly Center at Calloway Gardens, Pine Mt. GA; spearheaded the construction of and completion of the National Garden Clubs, Inc. Butterfly Garden at the US Botanic Garden; supported the National Garden Club's butterfly awareness program for many years, and has supported butterfly educational programs, publications, and study tours for garden club members and for the public. Life has taken me in many directions, yet those fundamental explorations of nature with him, set me on my way to be a naturalist. Special thanks toMichelle Mensigner, The New England Wildflower Society, Jackie Stone, Mary Arekalian, Ron Birrell, and the Dallas County Lepidopterists' Society for use of their images, and the National Garden Clubs for giving me the opportunity to work with them on Butterfly Conservation issues.